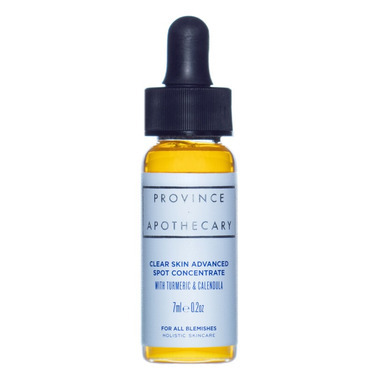 Province Apothecary concentrated blend of superior botanicals targets the appearance of spots for a brighter, revitalized complexion. It purifies acne-prone skin without harsh, drying or irritating ingredients, improving surface texture for healthier-looking skin. One drop is all you need to rejuvenate your skin! Gotu Kola: Increases collagen production and blood flow to boost skin’s natural healing ability, while Organic Plantain delivers essential nutrients to the skin. I didnâ€™t find this to be very effective and I could barely stand the smell. For me it was a waste of money. I am giving this product a 4 star since the smell is a bit strong and not to my liking, but it is a great acne spot treatment. I put it on my large blemishes at night and find that they are either smaller in the morning or dried out. A little goes a long way too. I usually use a q-tip to clean up the excess since the dropper tends to give too much. I would definitely buy this again. Did not work as well or as quickly as I hoped it would by some reviews, but everyone's skin reacts differently. Perfect size as a little drop goes a very long way. One draw back is it smells like a camp fire. This product was not great for my skin. Perhaps it depends what type of blemish is being treated-- I found it helped soothe some inflammation, but for other deeper hormonal spots it did not seem to help. Good size for trial or travel. This product was just okay for me; though my skin is VERY finicky. It did seem to help with inflammation/redness. However, I think the jojoba base did not work well with my skin--I noticed more congestion (bumpiness below the surface) overall. Great product and love that it is Canadian. I gave it 4 stars as it did not work quite as quickly as I had read in previous reviews. I have cystic acne around that time of the month and I tend to breakout. This product reduces the inflammation overnight. I wake up the next morning with literally no redness and a spot that diminished noticeably. I will definitely buy again. My skin is prone to deep, cystic acne, and this blend has become my "holy grail" face product. It significantly soothes and reduces blemishes while moisturizing my skin (vs. drying them out and leaving a flaky, irritated spot). The turmeric scent is strong, but not unpleasant. This product was obviously crafted by people who know the healing properties of the specific herbs/ingredients.